I got a little close for their comfort. Very cute pair of eyes looking out! What a treat those babysitting duties would be! Cute, kitties, I love the shot of the eyes looking at you. Oh, my goodness! Babysitting indeed! Happy New Year, Misty! Thanks for all you do! Very cute little ones aren't they? Lovely photos. Oh, so cute! I am definitely looking forward to picking out a new kitten. What a fun post! I'm laughing about cows adopting a cat and then having babysitting duties. I didn't know one could use up laptop memory with their photos. I have lots of them in my iphoto, and have been thinking I really need to delete some, but, like you, I have trouble doing that. I love your second shot where kitty is peeking at you..
My Camera Critter post. Have a good day! 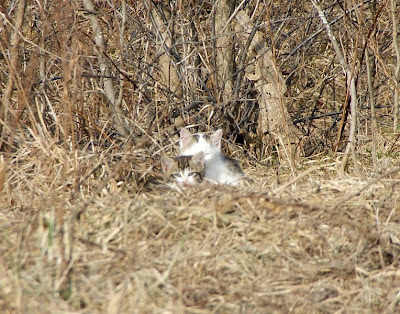 Kittens free in nature to be kittens. Those kitties are so cute, thanks for hosting CC. Have you thought about storing your photos on a memory stick? They're easy enough to pull off back to the computer if needed and should be backed up somewhere anyways. Nice shot of the "Peeping Cat" . . . hehe. Misty: You have to watch out for those attack cats. They take care of all the wild things for the cows. What lovely cat photos, they're so adorable! My first time joining this meme,hope you can take a peek on my first CC entry. Have a great weekend! prosperous New Year to you and to your family. 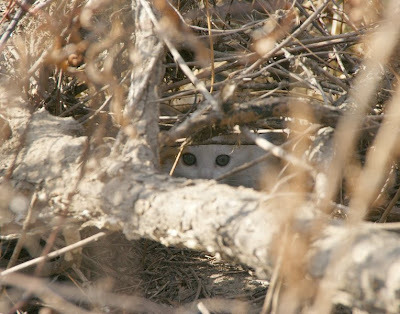 What cute kitty photos ... peeking out from the brush. Congratulations on setting up your Photography site with help from Lisa. I wish you much success and will check it out when time permits. Thanks for dropping by to see the fur-kids at Small Reflections earlier today. What a great entry you have! Wishing you all the best this year. God Bless to you and to your family. Mine is up! Hope to see you. Your comment is much appreciated. Oh cutie, kitty come come! I want to hug it! I'm trying to free up space on my laptop, too. My husband got me an external hard drive on Black Friday, and I'm slowly moving things to that. Of course, the photos must also be backed up to DVD! Lovely snaps. The last snap hidden behind the treee branches is very nice. awesome! wishing you all the best in 2010! mine is up. see yah. Cute captures of the critters. I wish you and all your loved ones a Very Happy and Safe 2010! happy camera critters! visit my 2nd entry! Happy new year! Ooo how adorable - love the peekaboo kitty. Congrats on the photo selling - lots of good luck to you :) Happy New Year!